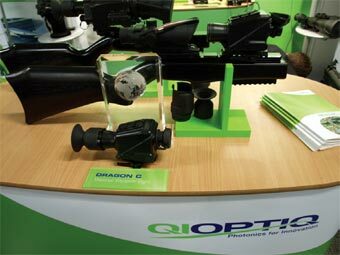 Soldier Modernisation | QIOPTIQ: Stand "In-Line"
Home | Industry | QIOPTIQ: Stand "In-Line"
2010 has once again proved to be a year of development and growth in the world of Qioptiq. The announcement that effective 1st September 2010, David Marks, Vice President of the Defence and Aerospace Division, had become Chief Executive Officer of the organisation, and that the current Chief Executive Officer, Fredrik Arp, (who joined Qioptiq as Chairman and Chief Executive Officer at the beginning of January 2010), will remain and serve as Executive Chairman of Qioptiq further demonstrates that the company is establishing its presence within the worldwide photonics markets and working even closer together to meet goals and provide a unified voice to customers. At the Defence and Aerospace Division, Mr. Marks has been succeeded by Mr. Steve Shaw. Mr. Shaw was the Director of Operations at St. Asaph and has been since 2003. Mr. Shaw joined Qioptiq in 2001 as Manufacturing Director. During his tenure as Director of Operations, Mr. Shaw has implemented many improvements in the manufacturing processes and overseen numerous capital investments that have resulted in a truly world-class facility at St. Asaph in the UK. Within the Defence & Aerospace Division, Steve Shaw is focussed on maintaining a steady pace of development within the Dismounted Close Combat / Soldier Modernisation market sector in order to ensure that Qioptiq products remain state of the art and provide features and capabilities called for by the User community. Moving forward, Qioptiq is committed to expand our product portfolio, adding significant value and capability to our products while maintaining the service and support chain to the customer in these austere times. The Dragon C Thermal Weapon Sight, (unveiled in volume 5 of SoldierMod) has got off to an extremely positive start. Voted Winner of Best Lightweight Soldier Technology 2010 at WBR’s Soldier Technology Global event in London during May. The Soldier Technology Global Conference and Exhibition is held every year at the Olympia Conference Centre, London. During the event Dragon C was nominated for the “Best new light weight soldier technology” selected on criteria such as innovation and cost, human factors and soldier acceptance, size, weight and power. Before the event each exhibitor at Soldier Technology was invited to select one product to submit for assessment in one of three award categories. A panel of ten soldier modernisation experts and programme managers toured in groups the entire exhibition visiting each stand to decide nominations for each award category. Per category there were three nominees and one winner. Winners and runners-up were announced in a ceremony on the evening of May 19th at the Hilton Olympia where Gen Sir Richard Dannatt was the guest speaker. Dragon C beat the competition and was selected as the winner. Steve Rickard accepted the award on behalf of Qioptiq. DRAGON-C weighs 375g, and utilising a 320x240 25u uncooled thermal core, it has been developed with lightweight and low power in mind right from the start. Power is provided by 2AA batteries with an overall power consumption of less than 1.5W. At all times throughout the design process, size, weight & power have been traded carefully against performance and cost to ensure that right balance of capability can be provided from the sight. We’ve learned a number of things from previous developments and poured our lessons learned into DRAGON-C. DRAGON C has been developed with Dismounted Close Combat & Special Forces users in mind. Qioptiq are currently supporting a number of customer demonstrations and trials where the DRAGON-C is proving to be a winner due to its compact size, reduced weight and ease of use. 2010 has seen a considerable shift in the focus to explore the capability and trades offs of the In Line sighting system approach. 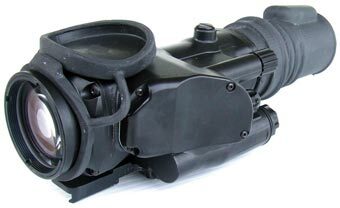 From the successes of the SVIPIR2+ In Line Thermal Imaging Sight that deployed with the UK MoD during 2008 and building on the lessons learnt Qioptiq have become world leaders in producing IN-LINE Night vision and IR weapon sights, Since the unveiling of the DRAGON - C and MERLIN range of weapon sights earlier this year, they have drawn the attention of Military and Security forces around the world. The equipment has been subject to some of the harshest tests in all environments by some of the world’s toughest forces and has set the benchmark for lightweight, multi-use IN-LINE sights. The benefits of using IN-LINE sights have the potential to outweigh those of a stand alone system, although there is and will be still a place for the stand alone systems on the heavier weapon systems, such as GMG and HMG which require the user to engage the target at ranges outside that of the PDW or Assault / Marksman rifles. The Benefits Of IN-LINE Sights include: Portability: The night vision device to be passed from user to user without the need to re- bore the sight as the accuracy of the weapon system is maintained by the day sight. Reducing the Training Burden: As In Line sights (largely) utilise the exisiting day scopes and their graticule patterns, the user has only to learn one gratical pattern and the associated adjustment of that Day Scope. The knock on effect is that users become more accurate at night because they are comfortable with the graticule markings on the Day Scope which ultimately increase the chances of a first round hit reducing the amount of ammunition and contributing to a lower logistics burden and through life cost. Retained Zero: Weapon zero is unaffected due to the X1 collimated optical design of the units. The designs have been optimised to work with a number of popular optical day sights from international manufacturers, therefore providing a wider range of opportunities. Boresight Stability: One area of significant design focus has been bore sight stability (the ability for the IN-LINE sights to remain stable under gunfire shock and temperature drift) as this is a crucial area often overlooked for clip on sights. Also the alignment of the input image to the output image is critical to ensure that the Mean Point of Aim (MPI) doesn’t move when the User mounts the sight unit in front of his day sight. Simplicity: As with all Qioptiq IN–LINE developments a simplistic Man Machine Interface (MMI) features highly, the need for the user to Clip on, turn on and use is paramount. Operators have to carry and operate more equipment than ever before, by taking the simplistic approach to equipment operation the user becomes more confident operating in low light levels and we significantly reduce the training burden. The Image Intensifier is far from being forgotten. In current fields of conflict there is a huge amount of pressure on local commanders to reduce the casualties inflicted on non combatants therefore positive identification (PID) is increasingly needed before an engagement takes place. The Image Intensified MERLIN aids in low light level PID giving the user a greater stand off capability and with the use of black light considerable advantages can be gained. MERLIN comprises of 3 variants aimed at the Assault Rifle, Sharpshooter Rifle and Sniper Rifle Users, so named Short Range (SR), Medium Range (MR) and Long Range (LR), the units provide different size / weight / performance trades, all offering simplistic MMI, common accessories and a power supply of 1 standard AA battery. The main effort in the design of the MERLIN family has been to deliver a system capable of retaining boresight even when subjected to the harsh shock impacts produced by modern 5.56, 7.62 and 8.39 mm rifles, for single shot, semi and full automatic firing modes. So with a static boresight retention of less than 0.5MoA, MERLIN is poised to deliver accurate results to Users who require the flexibility of a modular sighting system approach. DRAGON LR represents the other end of the spectrum from the DRAGON C, yet the sights share many features and architecture elements that bring them together as part of the overall DRAGON family. We can expect to be unveiling additional variants of the DRAGON family during 2011, with a new product Launch scheduled for the 2011 Soldier Technology Global event in London during June. Each DRAGON variant is targeted at providing a natural successive capability to our existing VIPIR2 fleet, but with reduced Size, Weight and Power, and additional future proofing features such as digital video and C4I hubs to allow integration into the wider section, platoon and company systems. Fusion – A Number of Solutions ………..
We can expect new Integrated and Fusion developments from Qioptiq in 2011 and looking into 2012 further exciting developments are on the horizon. The sensor fusion debate is now more appropriate than ever and Qioptiq have been busy developing the technologies and conceptual prototypes for internal development, we are confident that we will deliver capability across more than one waveband in the very near future. Having learnt a great deal during the past 7 years since the Thermal Imager Dismounted Infantry Technology Demonstration Project (TIDI TDP), and the launch / entry into service of the VIPIR2 fleet, which provided invaluable operational feedback; technology developments and manufacturing process developments means that we can now move forward to deliver greater capability in lighter, smaller packages. The DRAGON and MERLIN families are clear examples of this, however the inherent technologies we require to enable vision in the various wavebands are now significantly lighter weight, lower power and more flexible than they were even 3 years ago. The recent developments claimed in digital night vision and SWIR technologies also throw new variables into the mix. Over the last year we have spent significant time, money and resource in the Research & Development areas, ensuring that we capitalise on valuable experiences and new materials to ensure we stay world class, always one step ahead of our adversaries and two in front of our competitors.